Rulide is a semi-synthetic macrolide antibiotic used for the treatment of mild to moderate infections of upper respiratory tract infections (acute pharyngitis, tonsillitis, sinusitis) caused by susceptible pathogens. Rulide prevents bacteria from growing, by inhibiting their protein synthesis. 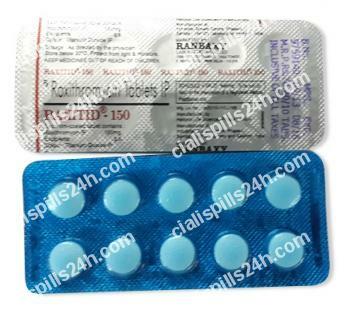 Rulide is taken once or twice daily, a daily dose is 300 mg for adults.Usual course of treatment is 7-10 days. In patients with hepatic failure half-life of Rulide in serum increases. If liver disorders are severe (hepatic cirrhosis with jaundice and/or ascites), the dose of the medications should be corrected. Small amounts of Rulide are excreted in human breast milk so breast feeding or treatment of the mother should be stopped if required. Hypersensitivity to Rulide or macrolide antibiotics, concomitant therapy with vasoconstrictive ergotamine type medications. Rulide is able to increase plasma levels of theophylline when co-administered. It also may affect activity of warfarin and erythromycin. In case of serious and persistent symptoms of allergy (hives, swelling of face and tongue, rash) consult your doctor about medical attention. In general Rulide is well tolerated.